When they are gorging themselves, the maggots' metabolic heat can reach 130 degrees. The black soldier fly is not considered a pest. It is about a half-inch in length and has a slender body. Phil Taylor hopes his startup, Mad Agriculture, can use insects to help cut food waste. Americans waste a staggering amount of food. Instead of letting it rot and wreck the environment, some entrepreneurs want to put it to work feeding insects, and see the potential to revolutionize how we feed some of the livestock that provide us our meat. Phil Taylor's enthusiasm for insects is infectious. The University of Colorado Boulder research ecologist beams as he weaves through a small greenhouse in rural Boulder County, Colorado. A room about the size of a shipping container sits inside. "We call this the breeding chamber," Taylor says. "I hesitate to say it, but it's called 'the brothel.'" The room's nickname comes in part from what happens inside. Its interior is packed full of flies — 20,000 black soldier flies, to be precise — mating. As they land, they face away from each other and shimmy their legs until their abdomens touch. The flies are about a half-inch in length, slender and black-bodied. When the light catches their wings, they reflect a bluish tinge. As a UV light hums from the ceiling, the flies hover around it, landing to mate on the room's walls. If all goes as planned, the female fly will lay her eggs in the chamber — eggs that will eventually turn into ravenous larvae. It's the larvae that Taylor is after. They're the moneymaker in this operation. His startup, called Mad Agriculture, puts the larvae in bins full of food waste – pulp from a local juice company – and lets them chow down for days. As they gorge themselves, the metabolic reaction in each 6-day-old larva gives off heat. Taylor places his hand on top of a bin filled with the writhing maggots. At about 130 degrees, it's warm to the touch. "This is all metabolic heat," Taylor says. The flies aren't attracted to humans and aren't considered pests. Instead they're known for their ability to aid in decomposition of organic materials like food waste. When the insects have reached an appropriate size and weight, Taylor sifts them out, kills them and turns them into treats for backyard chickens. Any leftover castings, called frass, make good fertilizer, Taylor says. While his business is still in its initial phase, he's hoping to get the product out to customers later this year. 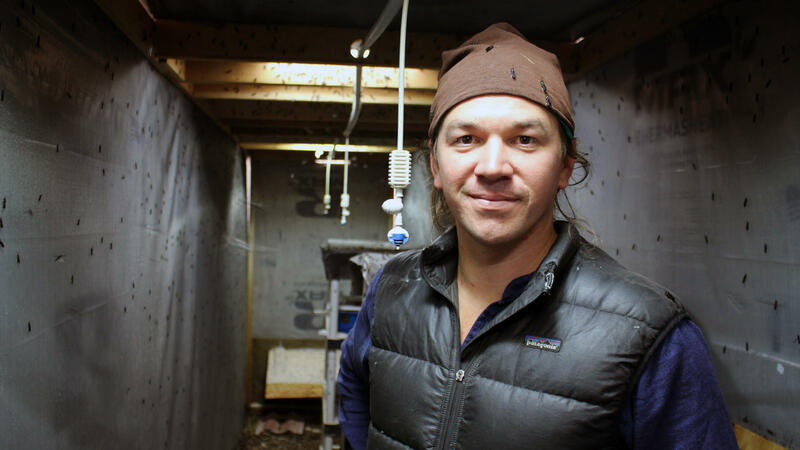 Eventually, he wants the company to get big enough to turn tons of larvae into a protein-rich feed ingredient for large-scale chicken farms and fish farms – and to put small-scale insect refineries in municipal waste facilities across the country. Chickens, hogs and farmed fish on large-scale operations are often fed a mixture of nutrients, compiled at feed mills and sometimes turned into pellets of grain, fat, protein and other base nutrients. Protein can be one of the most expensive ingredients in animal feed, and it's often made up of soybeans or fish meal. Taylor sees opportunity in injecting a brand new protein source into the mix. "We can produce the equivalent to an acre of soybean protein in two weeks in this little tiny refinery when it's fully cranking," he says. "Not requiring any fertilizer, no water, no arable land." Black soldier flies are quickly becoming the hot new feed ingredient. Big operations have sprung up in the U.S., Canada and South Africa. 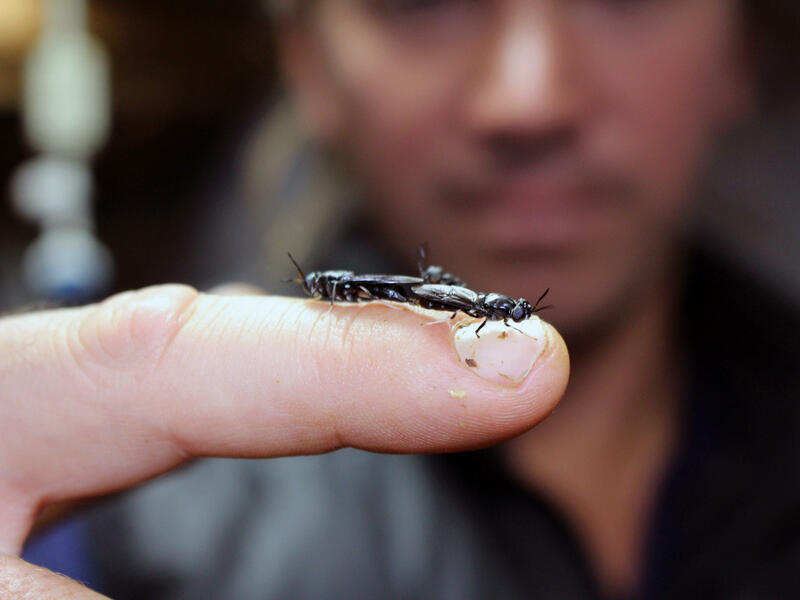 In Austin, Texas, the nonprofit Little Herds is taking a less centralized approach, trying to get smaller insect refineries onto farms outside the city that could turn food waste into feed. 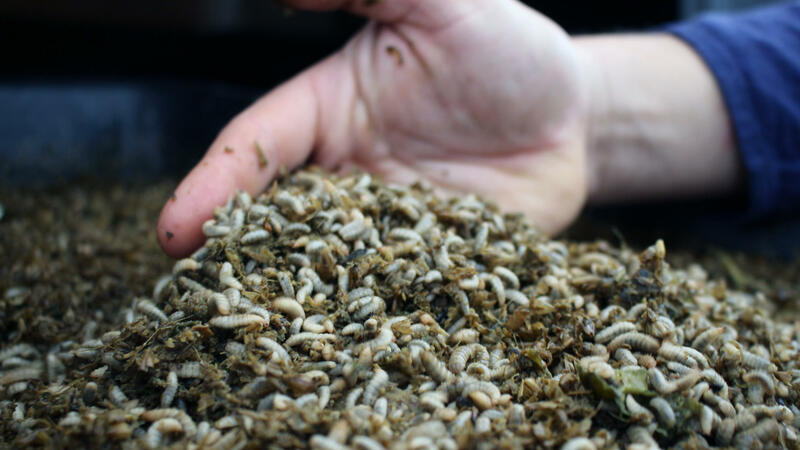 The idea of using insects as livestock feed has enough heft to earn an endorsement from the United Nations' Food and Agriculture Organization. "We can empower these farmers with equipment and the expertise to turn food waste into the proteins for their livestock," says Robert Nathan Allen, president of Little Herds. But why these particular bugs? It's all in their appetite. "The larvae when they hatch from the eggs are barely visible to the naked eye. But they can grow to be as large as a half a gram each," says Texas A&M University entomologist Jeff Tomberlin. And that's in just a matter of days. "They're voracious in terms of appetite," he says. "They can consume just about anything organic from plant to meat." The insect farmers see their greatest opportunity replacing fish meal: a protein-rich powder made of ground-up fish, often fed to farmed fish, hogs and other livestock. And Tomberlin says over the past couple of decades, fish feed has become much more expensive, leaving an opening for protein from bugs. "They're one of nature's custodians," Tomberlin says. "They go around and clean up organic matter that's decomposing and turn it into something valuable." Switching to feed made primarily of insects instead of fish meal would keep some of those fish in oceans, Tomberlin says. And it would divert food waste – a huge source of greenhouse gas emissions – from landfills to feed insects. Even though there's a ton of buzz around insect growers, they have a long way to go. Rick Barrows, a fish feed consultant in Bozeman, Montana, says it's still early. "If you talk to the large feed manufacturers, they'll laugh at insects because they just say you'll never be able to produce large enough quantities," Barrows says, "'I need 100,000 tons a month, can you get me that?'" Federal regulations have also been slow to catch up to the growth of insect farms. The Food and Drug Administration currently does not allow insect-based protein powders to be added to animal feed, but those in the industry say they're lobbying hard for changes to allow for more insect-based ingredients. In the meantime, insect-protein companies like Mad Agriculture can legally manufacture edible treats for livestock. Some states have also loosened their rules to allow for insect-based feed. Back at Mad Agriculture, Taylor isn't deluding himself. He says it's unlikely that insects will ever fully overtake fish meal or soybeans in livestock feed. But he says it gives farmers another option and could have big environmental benefits. If nothing else, these insects help make our food waste disappear. "One thing we're missing out of the human system is decomposers," Taylor says. "We don't think about it. We just throw it in a ditch. We're great at farm to table, but we're really bad at table to farm."